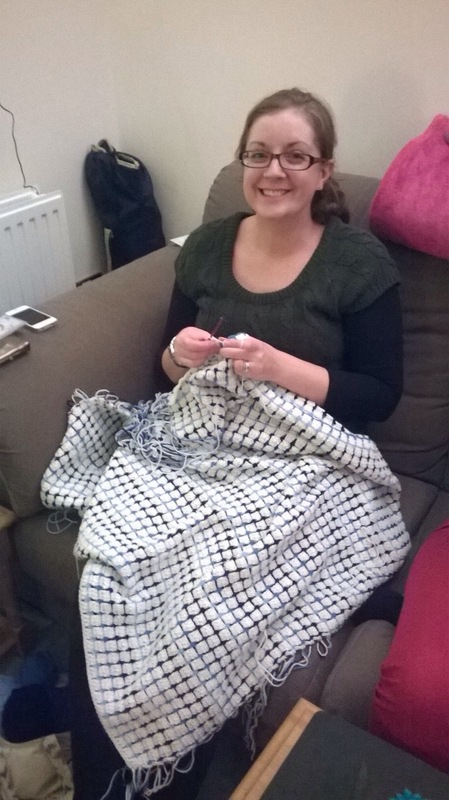 … and I was feverishly working away on my latest memory quilt, desperately hoping to complete it on Christmas Eve just in time for the big day. 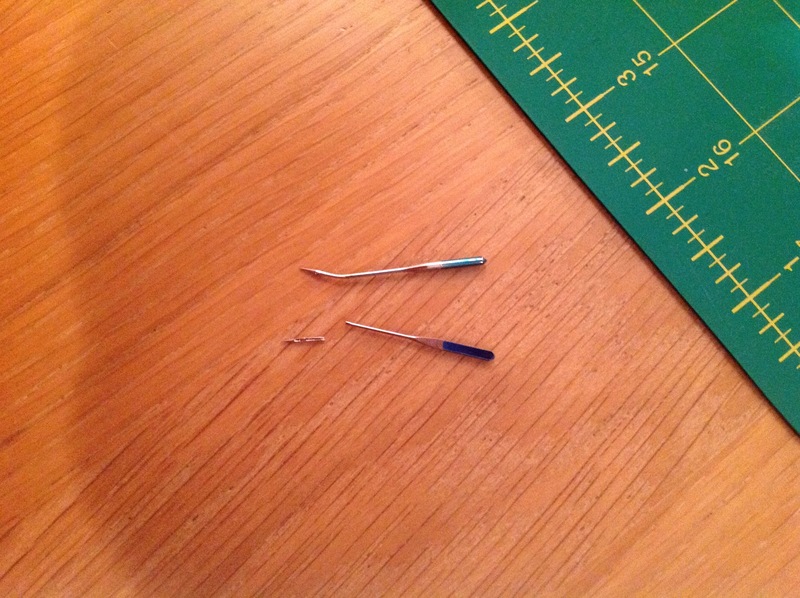 Thanks to the denim squares, I’d encountered a few of these and was down to my last needle. 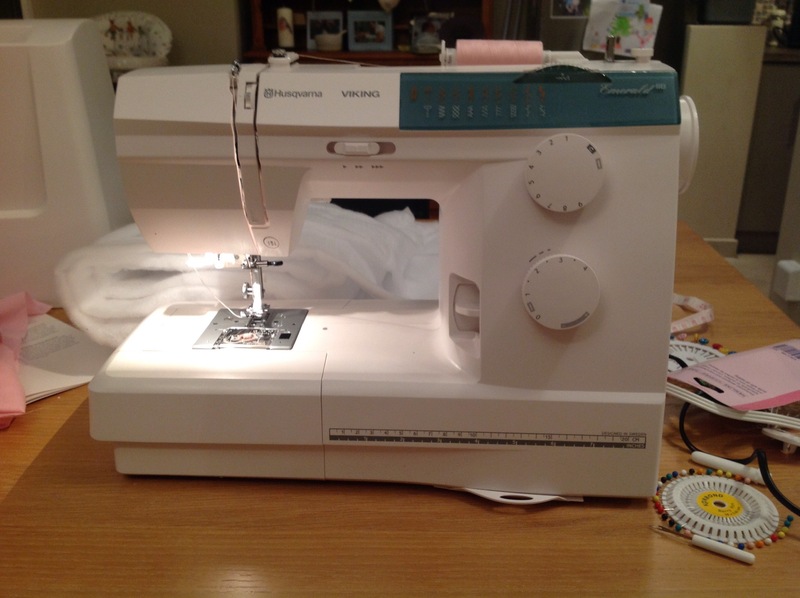 All was going well, the quilt top was sewn, the borders were on so I called it a night. Just as I was dozing off, I had one of those moments of sheer horror when I realised I’d made a major error. I’d cut the borders from the backing fabric before cutting the backing section out. Which meant I didn’t have enough backing fabric left to create a single piece for the backing. Sad, sad face. On the plus side, it meant that I had Christmas Eve free to relax run around like a mad thing getting ready for Christmas Day. So, why this post? Well I was waiting to do the big reveal of the finished quilt. But that’s a way off yet. Instead, I want to introduce you to the latest addition to our family. Tonight is the first chance I’ve had to play with it. I’d asked for it, but my kind cruel husband left me hanging til late afternoon to give it to me, via a treasure hunt with clues. I may have been getting a bit grumpy by then that Father Christmas hadn’t delivered on the one item on my list. I’m hoping to baste the quilt top to the wadding tomorrow, before quilting star shapes on a few of the squares. I’m not going to give a sneak preview. You’ll have to wait til it’s finished! Mr Postman, please deliver my next lot of backing fabric soon! 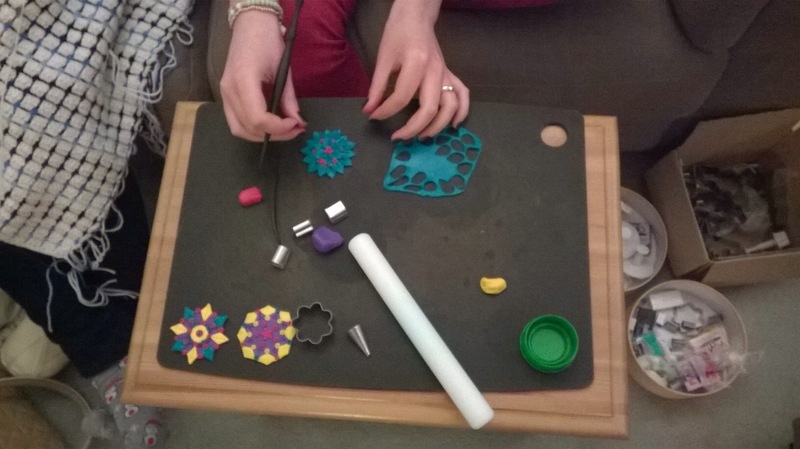 On Sunday, it was time for our annual Christmas Crafternoon. An excuse for colleagues old and new to get together, wear Christmas jumpers, eat Christmas food and, most importantly, craft. While watching Love Actually, as we do every year. Apologies for the grainy photos, my phone camera doesn’t have a flash. Or take good photos. 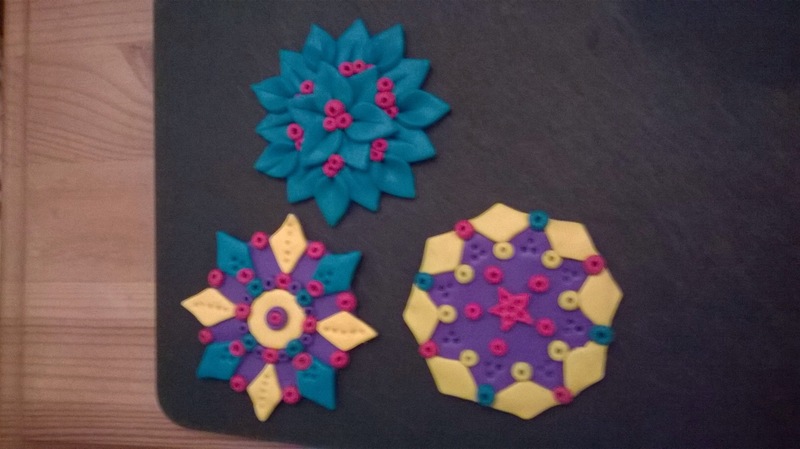 Maddy made Christmas decorations out of modelling clay. These will go in the oven to harden and then will be ready for the tree. They were so intricate, it was fascinating to watch. And I worked on my cross-stitch. 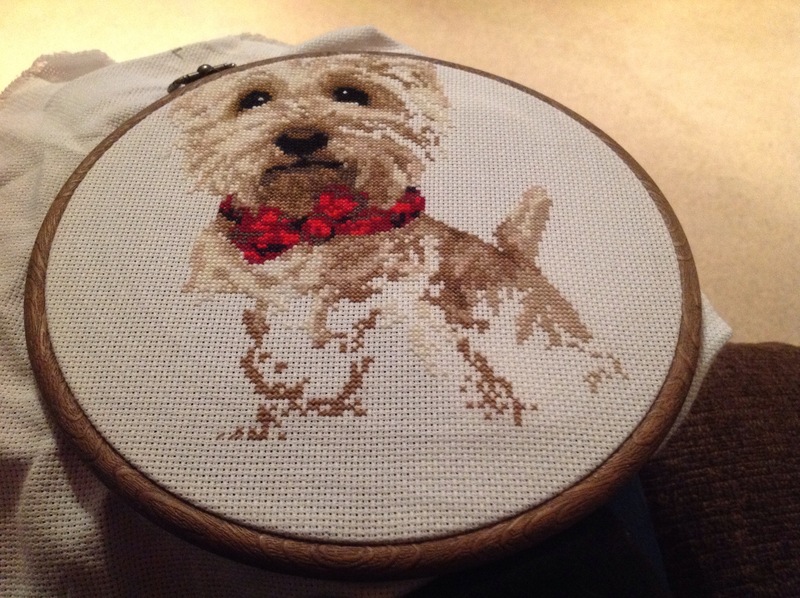 When I started this blog back in May in an attempt to motivate myself to finish my unfinished projects, I said I hoped to have this finished for my Nan’s birthday or Christmas. It’s her birthday tomorrow, so as you can see, that’s not going to happen. Maybe next year? Anyway, a lovely afternoon was had by all. 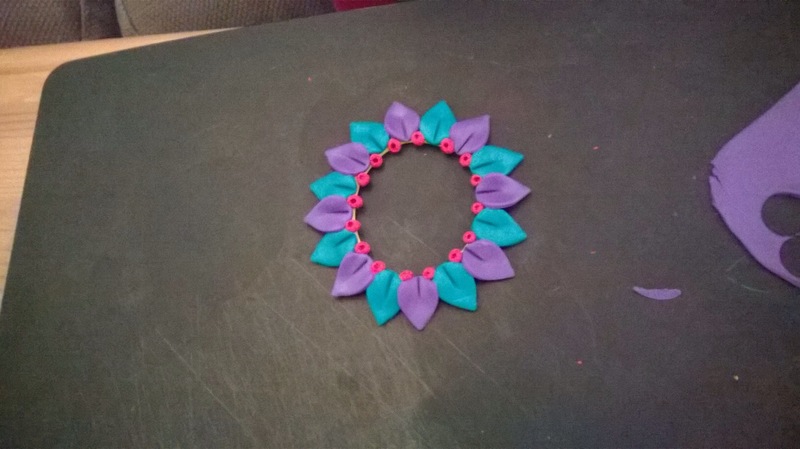 Roll on next year’s Crafternoons. Let’s hope we can fit in more than two next year. 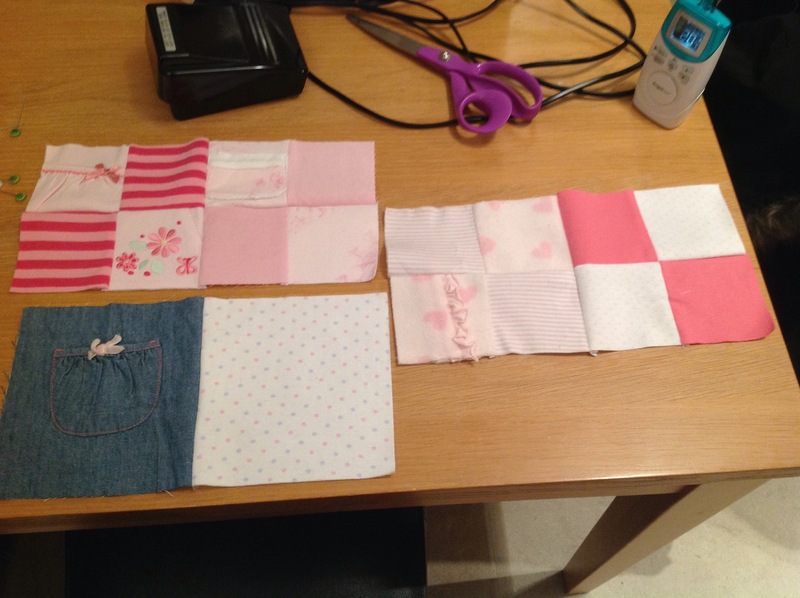 I was actually expecting a couple of outfits or something that I could cut up and make some sort of patchwork stocking from, like a smaller version of the memory blankets I’ve been making. 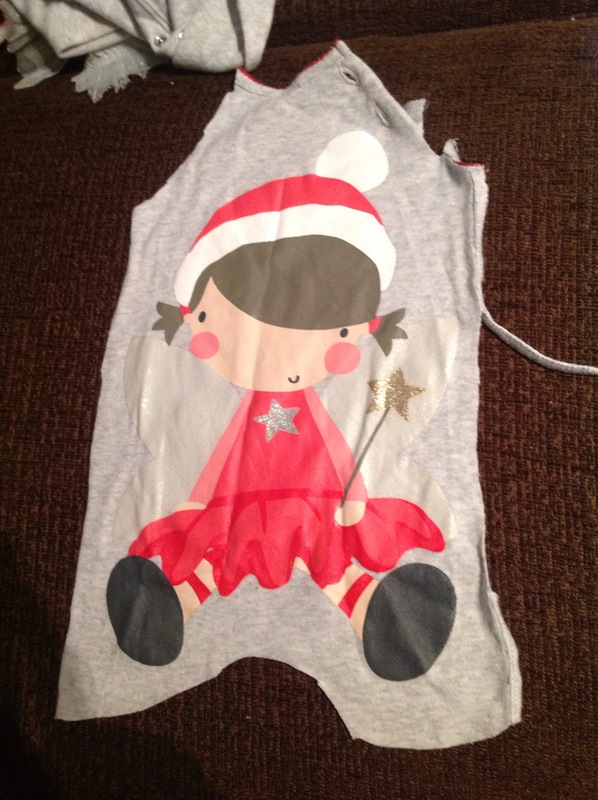 However, my friend was envisaging the angel from the babygro being mounted on a stocking. That night, I cut the angel out. 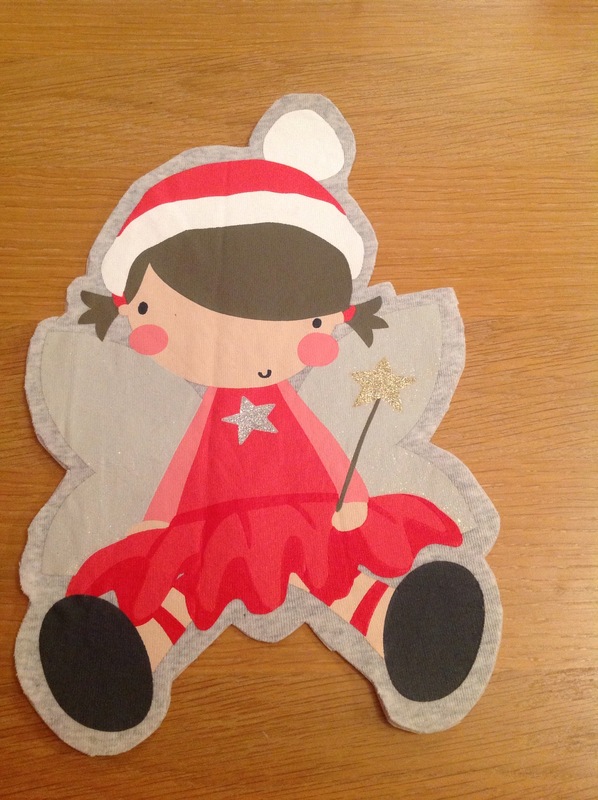 I was going to buy some red felt the next day, and then I remembered … I was supposed to be attending a Christmas Angel making craft session last month with my Mum. We couldn’t make it, but I’ve still got the fabric I bought for us. 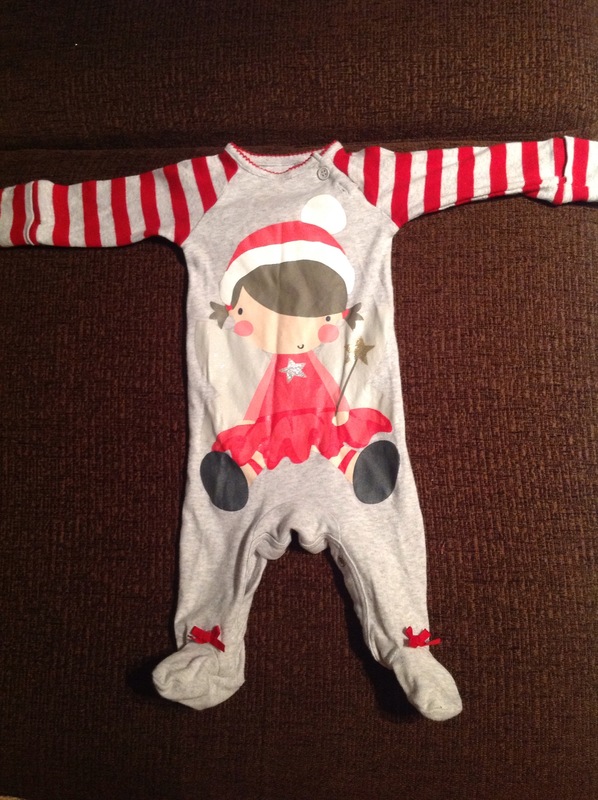 My friend requested that above all else, I keep the stars from the babygro as her daughter loves stars at the moment. 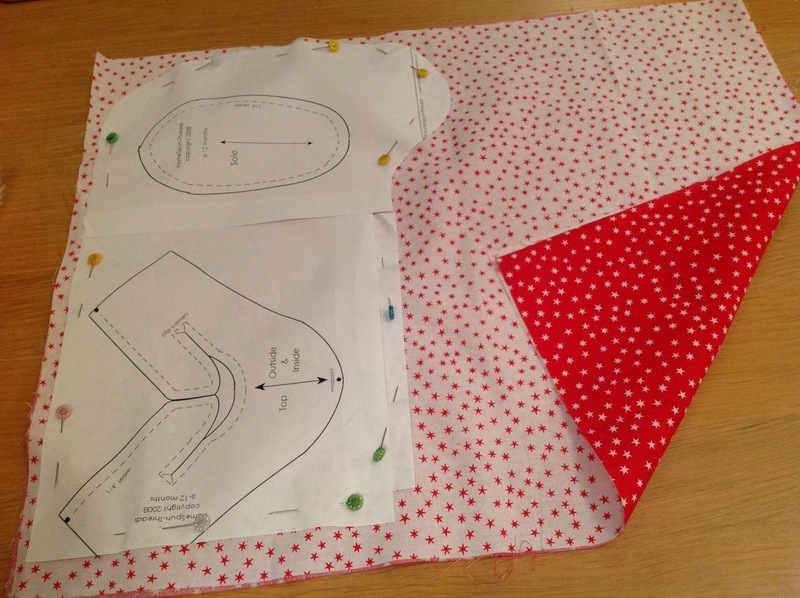 As luck would have it, I had some star fabric, in red and white. 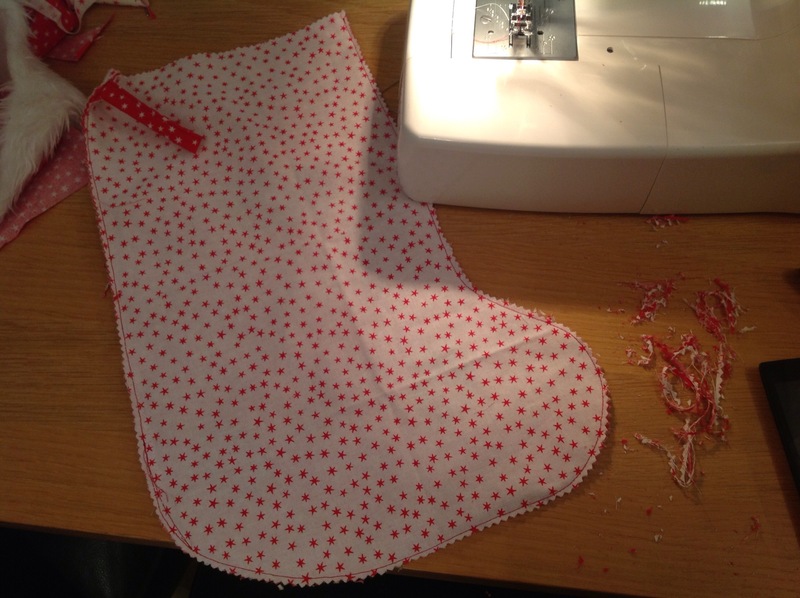 So I decided to do a lined stocking, with the outer fabric bring red with white stars and the inner, which would be turned over and shown as the cuff, white with red stars. I interfaced the angel, ready for appliqué. 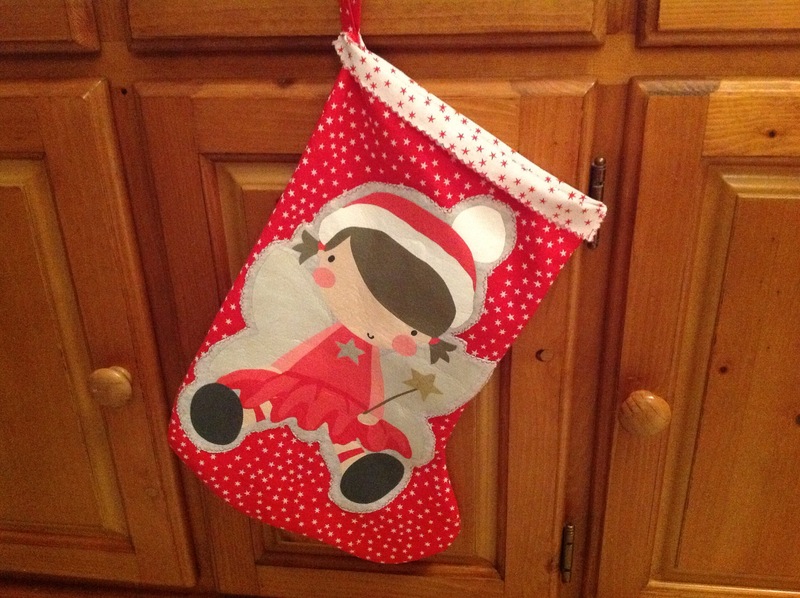 Then I traced round the stocking my Mum made for my little boy, to get a template. 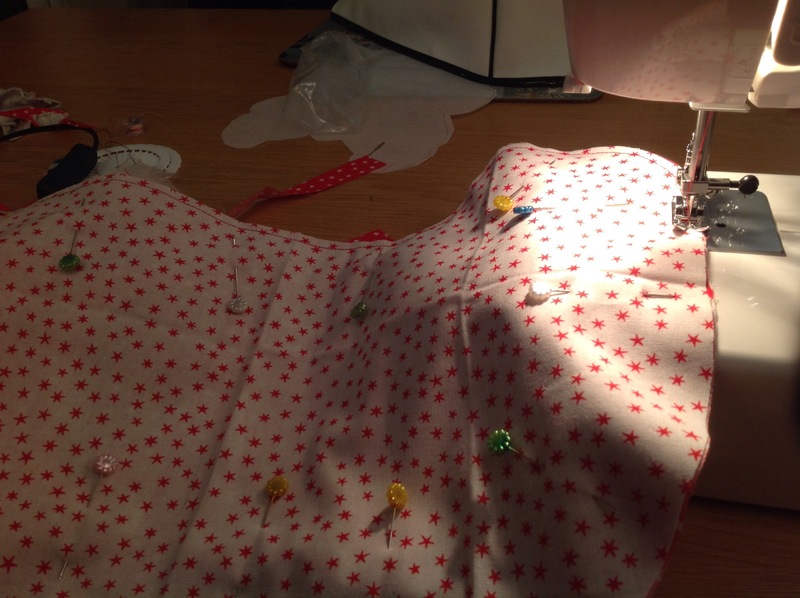 Then I pinned it to my fabrics, which were wrong sides together. 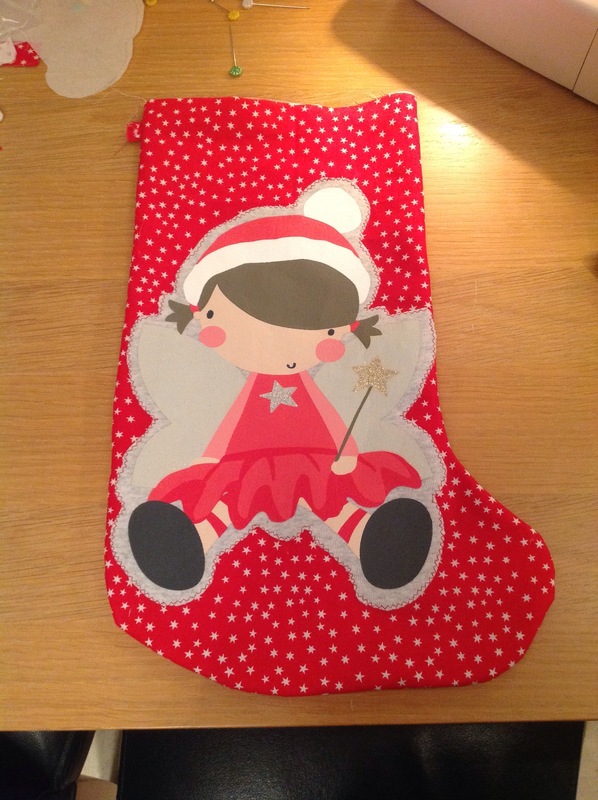 Then I appliquéd the angel to the front piece of the stocking. 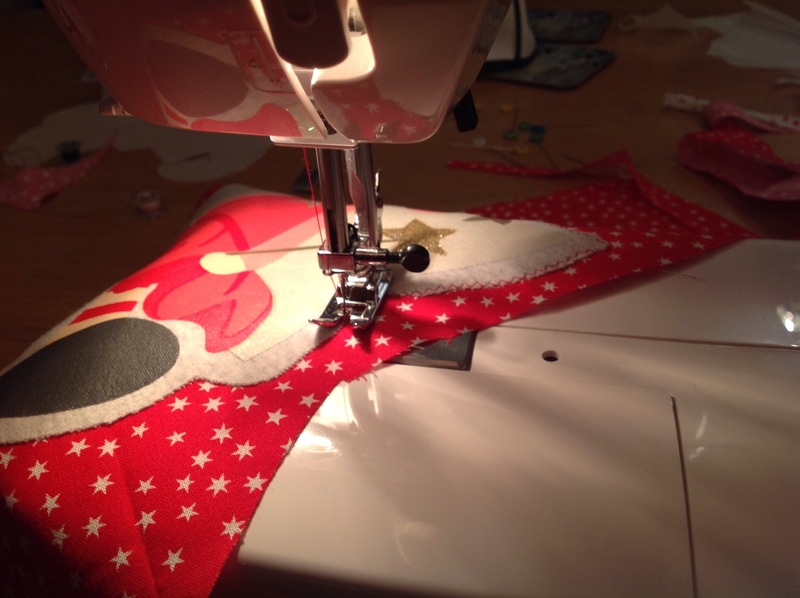 After that, I sewed all the stocking pieces together. I made a loop from a scrap of the red fabric and sandwiched it between the layers, so that it would be on the outside when the cuff is turned out. I used my pinking shears round the top of the stocking, so the cuff had a nice edge. I then used them round the inside seams, to stop fraying and reduce bulk. Pretty happy with that, especially as it only took about 2 hours. And little Emelia loved all the stars. Can’t say better than that! I ended my last post by setting myself the (slightly overambitious) task of sewing the quilt top of my latest memory quilt by the end of that week. I failed. Miserably. Over two weeks on, I’m hardly any further on. 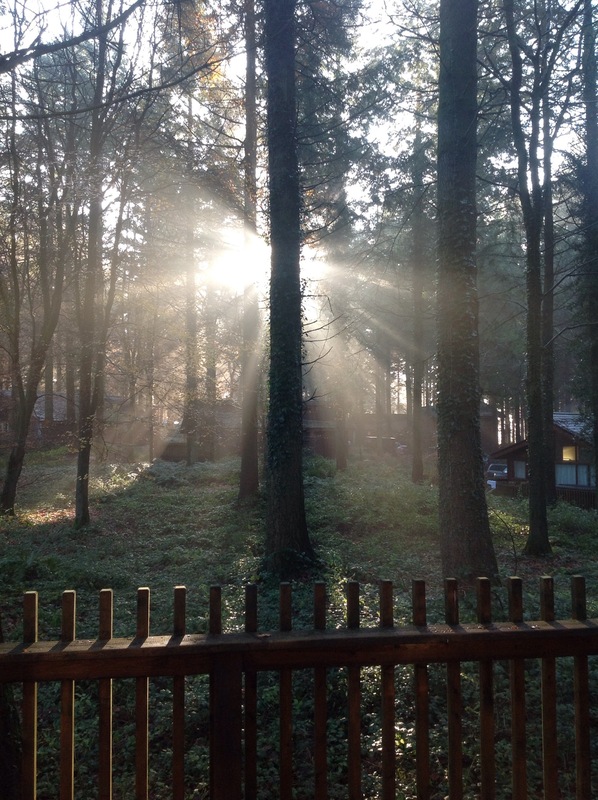 A lovely girly weekend spent in a log cabin in the Forest of Dean, on the last weekend of November. There was a hot tub and prosecco, need I say more! 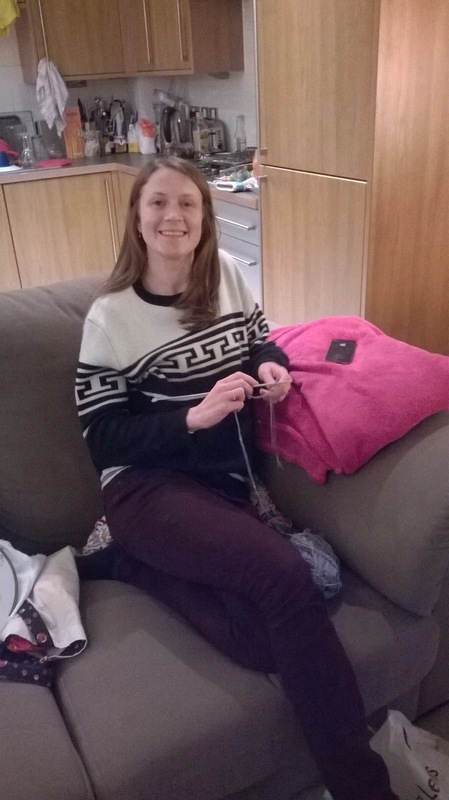 But for me, the absolute best bit was spending Saturday afternoon cross stitching whilst watching a film (About Time) and eating chocolate. Bliss. And something, as a Mummy, I never get to do anymore. (Little Man remained at home with Daddy.) 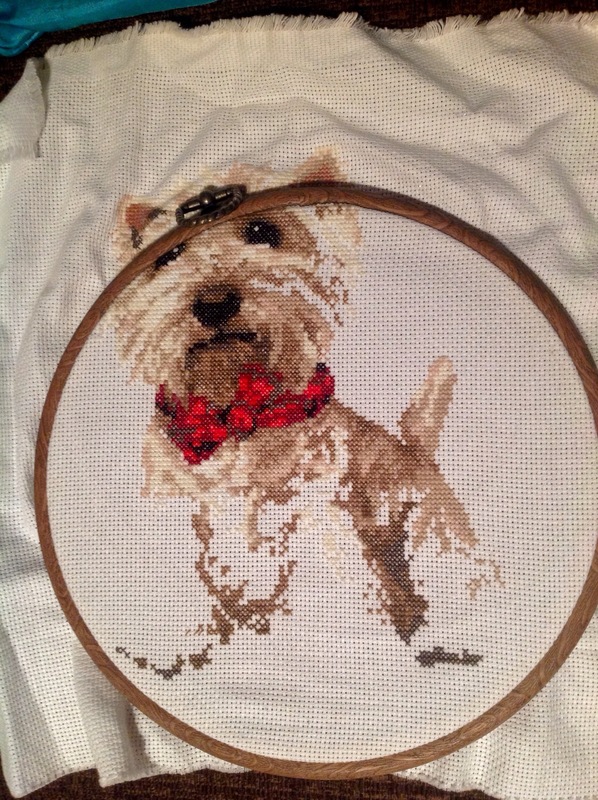 So, despite a complete lack of progress on the quilt, I have made inroads on my cross stitch. One evening last week, I got a little done on the quilt. And, on the craft front, that’s been it. On Saturday, I completed my 5th Grim 8. 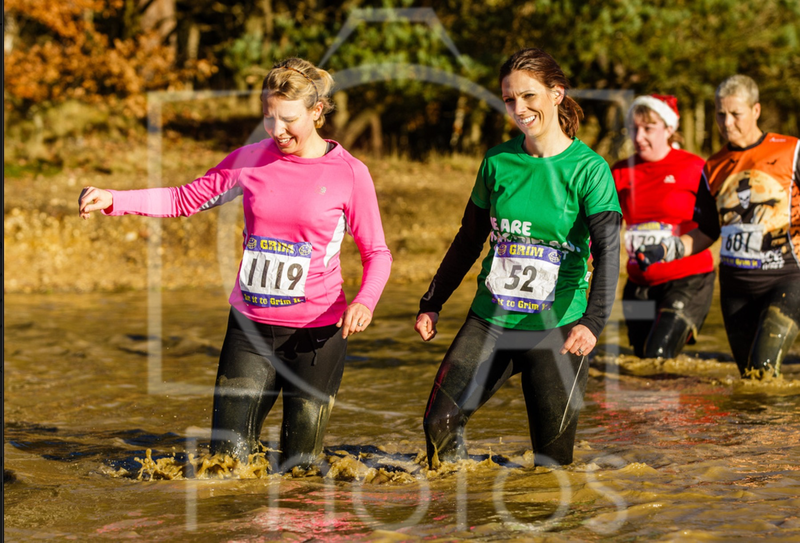 Which is an 8 mile run through mud and water on tank training land in Aldershot. 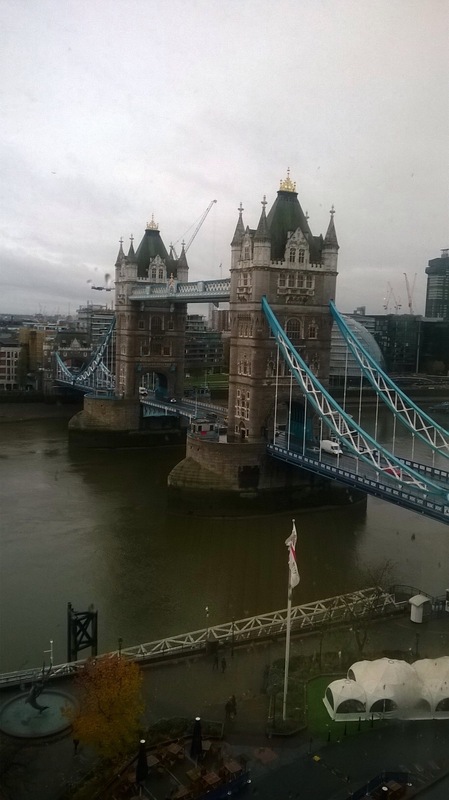 As a post-race treat, we went up to London, staying near Tower Bridge. Very near, as you can see from the view from our hotel room’s window. 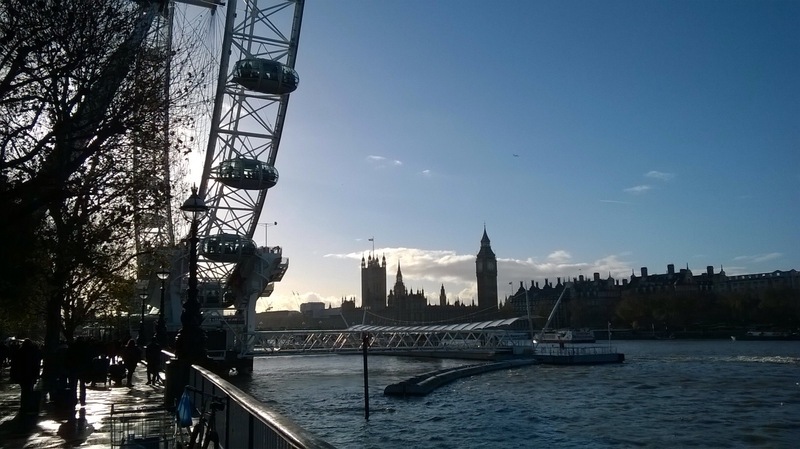 And before heading home, we had a lovely sunny walk along the South Bank. 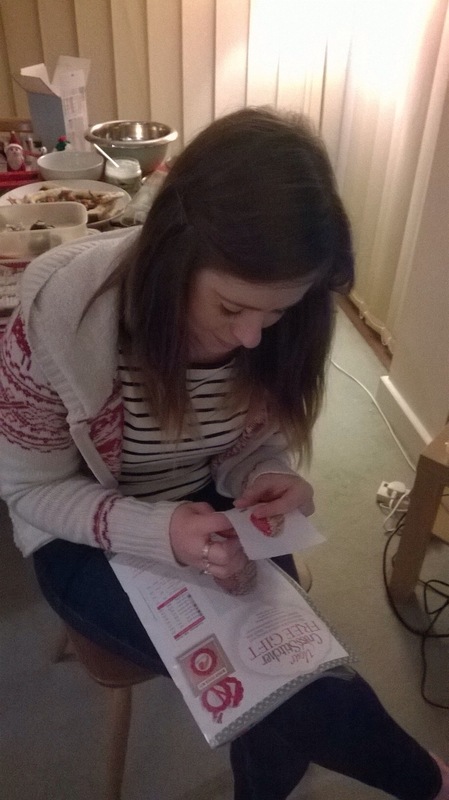 We’re hosting a Christmas bash on Saturday and my head is full of crafty ideas of things to make in advance. The sad thing is, I’m seriously lacking in time. I might see if I can squeeze in some bunting, but that’ll be about it. 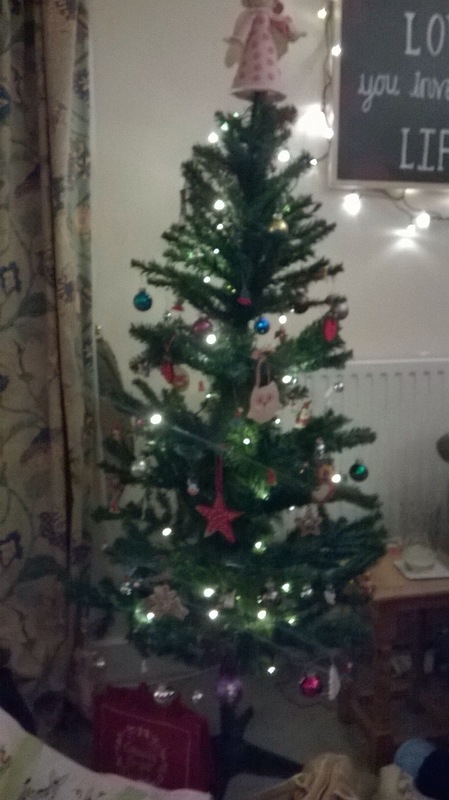 On a more positive note, we put our tree up last night. 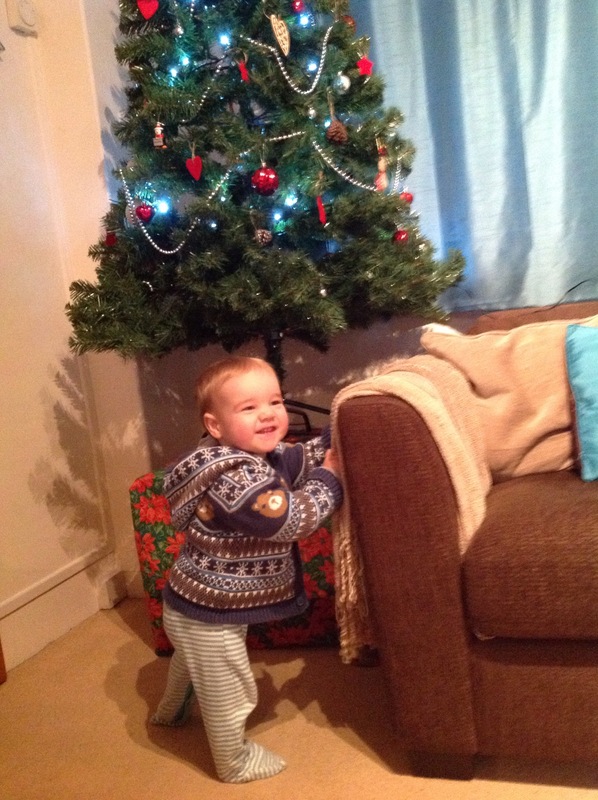 How long til my little monkey pulls it over?